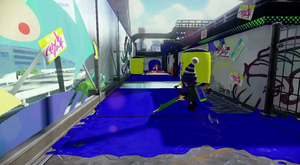 Urchin Underpass is a multiplayer stage in Splatoon. Urchin Underpass consists of two large L-shaped areas of land that are joined together by a rectangular piece of land between them. It takes place below a highway. The spawn point of Urchin Underpass is fairly complicated despite being a usually neglected area. It is a large, enclosed area with several slopes descending to the lower floor, as well as grates leading away from it. The area around the spawn is a high, wide level with railings surrounding the edges, and the only way up is through the winding ramp situated at the corner in front of the spawn point. The spawn point area is accessable to the enemy team. The spiral ramp also has a walkway that leads to an alternate entrance in to the main arena. Dropping down to the lower floor, the path toward the center of the map splits. 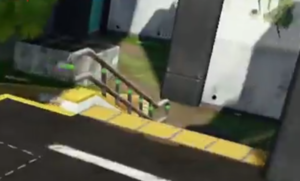 One is an elevated path partially protected by railings and hard to reach for the enemy team, while the other is behind a grated wall squids and ink can easily pass through, but solid objects like bombs can't. A pillar juts out where the split paths converge, and is tall enough that only players from the upper level can jump to. Beyond the pillar is a steep ramp leading to a side area that functions as the team's battlements. There are large patches of uninkable ground as well as two openings that make for popular sniper outposts. The opening closer toward the middle has an inkable wall so that anyone from below can swim up to it. A large multilayered hill marks the entrance to the center, while a narrow alley runs beside it. At the end of the alley is a small flat square, and beyond that is the frontlines where shots are traded, which has a ramp for daring jumps into enemy territory, a wall for cover and two ramps leading down into the gorge between either team's concrete platforms. The platform walls are all inkable, allowing for surprise attacks from within the gorge. Two trees are placed at either end of the gorge for cover. There are no hazards in this stage. Box on each side of the Splat Zone. Urchin Underpass in different terrain. 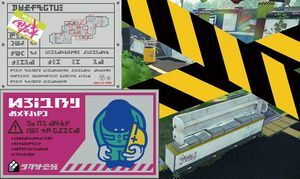 The Splat Zone in Urchin Underpass is located at the very center of the map. It is the smallest singular Splat Zone in Splatoon so gaining and staying in control requires lots of attention to it. Boxes have been added near both ends of the Splat Zone to provide protection from enemy fire and a vantage point to attack the Splat Zone. In Tower Control, the tower starts in the Center Plaza. It moves straight back towards the enemy territory and climbs up. Then, it moves to the rider's left, climbs back down, and reaches the goal. 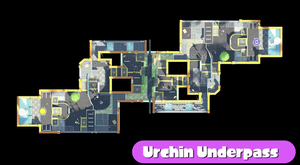 The Rainmaker in Urchin Underpass is located in the center of the map, just below the two ramps in the center. The goal is at the end of the small strip of land with 4 stripes in front of the opposing team's base. Two stacks of blocks have been added to help both teams get to the center of the map faster. Urchin Underpass underwent a series of changes between its development period and release. It is also used in Octo Valley mission #21, Unwelcome Flying Object, as well as the Battle Dojo in the released version of it. Early design Version of the center of Urchin Underpass with a rabbit that was chosen as the design for the characters. The center is very similar to the E3 version and the release version of Urchin Underpass. A later design of Splatoon featuring rabbits on an early Urchin Underpass. Note the almost-complete Splattershot. 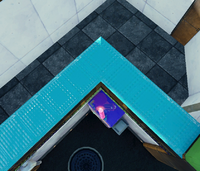 A water tank guarded by a fence could be found in the corner of teams' bases. The raised platform opposite the Spawn Points in teams' bases was accessed by one smaller ramp, included a wooden plank used to swim up through a grated platform, and did not provide access to the Center Plaza. The lowest area in teams' bases was much larger. When leaving a team's Spawn Point and heading left, the first ramp encountered was not present. Instead, players could go around the raised portion on either side. This raised portion was split into three differently-sized platforms, and a window was not present in this location. The walls of the Secret Alleys were concrete, not glass. When entering the Center Plaza from the main entrance, a small fence acting as a grated barrier was present on players' immediate left. The ramped platforms allowing players to jump to the other side of the Center Plaza were directly opposite each other. The middle area in the Center Plaza was slightly smaller. The grated walkways outside the Secret Alleys in the Center Plaza were extended. The three platforms near teams' bases. The water tower and smaller raised area. A map of the old Urchin Underpass. In this version, the center of the is almost the same as in the E3 version but each side's base was changed completely from removing grates and high platforms to ramps and high advantage points. There are two alleys located near the Center Plaza. They are long, narrow, hidden-away strips of turf that are difficult to access which have two Glass panels. This version was not balanced and Nintendo decided to make some changes so it will be easier for both sides to play on it. One of the "Secret" Alleys. The image released by Squid Research Lab announcing changes to Urchin Underpass. The trees near each team's base were moved to the center of the stage. The secret alleys were extended and pushed further away from the central area. They were also widened, and given another access point to the center area. The grated walkways protruding from the secret alleys were removed. The ramps leading into the central area were made so that they only took up half of the available space. The other half became flat turf. Overall layout has been adjusted in all modes. The stage map shows the layout of the old Urchin Underpass. 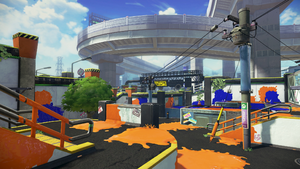 A promo image of two Inklings, with Urchin Underpass shown in the background. 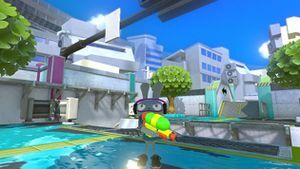 A screenshot of the E3 build of Splatoon, showing the only stage (Urchin Underpass) and the only weapon (Splattershot) at the time. Old Urchin Underpass during Splatfest. Old Urchin Underpass during Splatfest, showing graffiti and the former alleyway. Old Urchin Underpass during Splatfest, showing graffiti at the center. Old Urchin Underpass during Splatfest, showing the night sky. Old Urchin Underpass during Splatfest, showing some Cat graffiti. Old Urchin Underpass during Splatfest, from mid-Super Jump. A sparrow on a power line above Urchin Underpass. Concept art of various objects at Urchin Underpass. Concept art of different locations. "Highway" is an early sketch of Urchin Underpass, and "Suburb" may be as well. Map of old Urchin Underpass. Top view of the map. 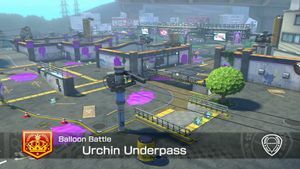 There is a battle course in Mario Kart 8 Deluxe of Urchin Underpass with much more open areas for karts and purple ink to slow down the karts. In Coin Runners, the coins are replaced by the Cash from Inkopolis.When getting an item, the reroll sound will play. The L-shaped space which Sub Weapons simply pass right through. An early version of this stage was first revealed at E3 2014 and was the only playable map at the time. 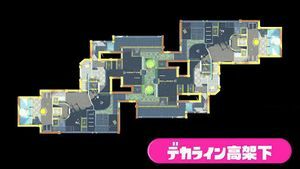 Urchin Underpass is the only map in Splatoon that has been changed almost completely after being released. Near the center area is an inaccessible, L-shaped space, which can be seen by standing on the vending machine in the corner. The floor and walls are fully textured to match the rest of the stage, but the floor is not solid; Sub Weapons thrown in will never be heard landing. The utility poles featured in the teams' bases are decorated with various license plates, many adorned with the Splash Mob and Forge logos. It is unknown what purpose these license plates serve. Before Version 2.0.0, two utility poles in the center of the stage featured the same license plates, but with Shrimp Kicks and Krak-On advertising instead. They were removed in the update. Its design and Japanese name are based on Jūjō-dōri (十条通, lit. Tenth Road) in Kyoto, near which Nintendo's headquarters is located. In Mario Kart 8 Deluxe, the grates leading to the side alleys are raised. The internal codename for this stage in the game files is "Crank". Urchin Underpass is derived from the nouns Urchin and Underpass, Urchin can relate to two things, It can relate to dirty and poor way. Sea urchins are spiny sea creatures that are round and prickly like hedgehogs. Underpass is passway for passangers and cyclists beneath a road or railway, allowing them to reach the other side in safety. デカライン高架下 Dekarain Kōkashita is derived from Deca-line and Underpass, a passway beneath a road, bridge or railway. This page was last edited on 26 February 2019, at 16:24. This page has been accessed 49,798 times.